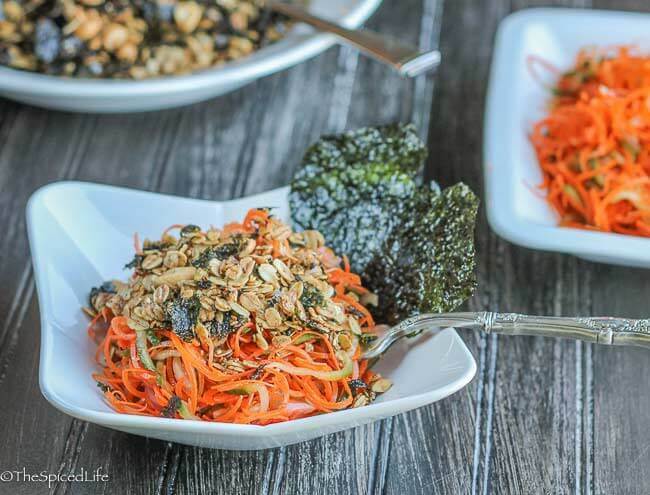 Spiralized Sake Carrot Salad with Nori Granola Topping is an addictive and healthy blend of Japanese inspired textures and flavors. The entire family adored this salad! Affiliate links were used to link to items I am discussing. 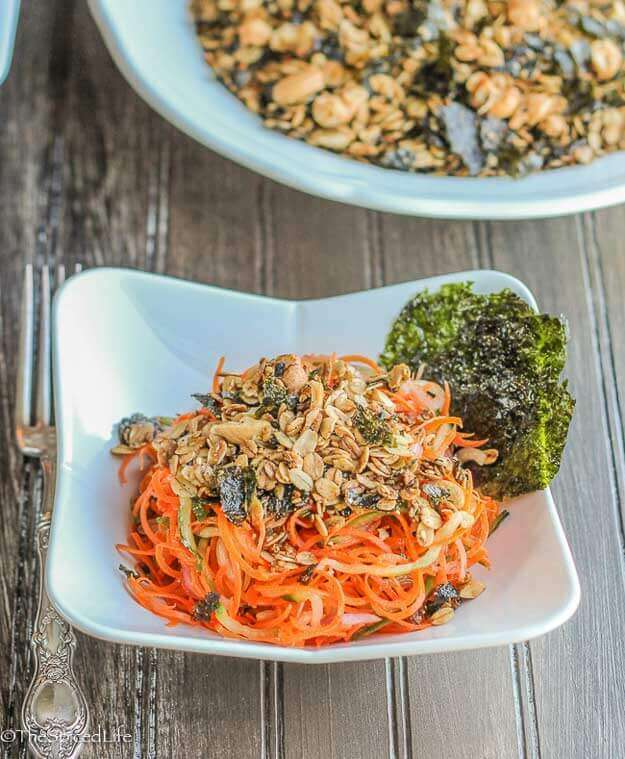 I meant to have some posts in between the Nori Granola and this Sake Carrot Salad but between Thanksgiving, traveling for the holiday, holiday baking, and, well, life, it just did not happen. And then I figured I really wanted to get you this salad so you would have at least one dish I recommended serving the granola with. So pardon the lack of holiday baking and Thanksgiving leftovers posts (although you guys know I hate turkey so I never really have the latter anyway), but you really must try this salad. Any time of year. It is that good. Promise! Besides you know me. Christmas cookie posts are coming! 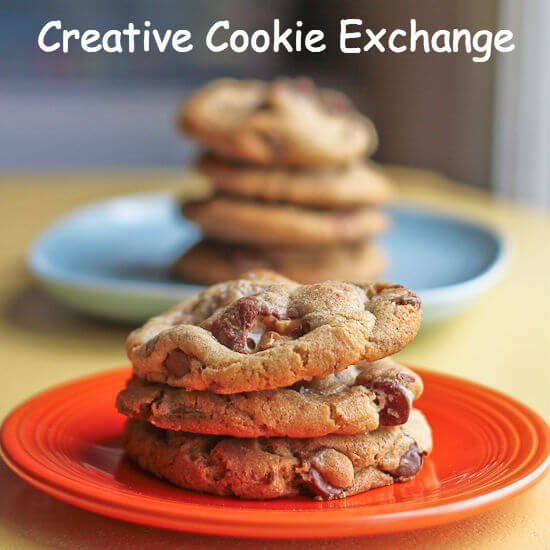 As well as updates of older Christmas cookie posts. So stay tuned! Before I tell you a bit more about the carrot salad I have to pause and share this photo of Alex. She is getting so old! She really looks like she knows what she is doing behind that camera! I can honestly say I am not sure if I have used some of her photos or not–I think I have! So she did a good job too…. Anyway, this salad. This salad is adapted from a salad in Heidi Swanson’s Near & Far: Recipes Inspired by Home and Travel , just like the Nori Granola. Heidi calls for toasted nuts or seeds on her carrot salad, and as soon as I saw the recipe I knew I wanted the granola on it–and was quite frankly surprised the recipe didn’t suggest it. In the book, the salad is a grated salad, but I also instantly knew I wanted to spiralize it. I adore spiralized salads. I spiralized both the carrots and the cucumbers–the carrots on the finest setting, and the cucumbers just one setting thicker. I also substituted some very thinly sliced red onion (that I also briefly soaked in cold water to tame it) for green onions because I was out. Guys this salad was amazing. And the granola was crucial. All of the flavors played off of one another brilliantly. I can honestly say that we ate every last drop of this salad, and this is one of those dishes that now, several days later editing the photos, I am seriously wishing I had another bowl of it. And I do still have some granola, so…. Make it! You won’t be sorry! Adapted from Heidi Swanson. You can substitute toasted seeds or nuts for the granola, but I highly recommend you try the granola. You can find the Nori granola here. 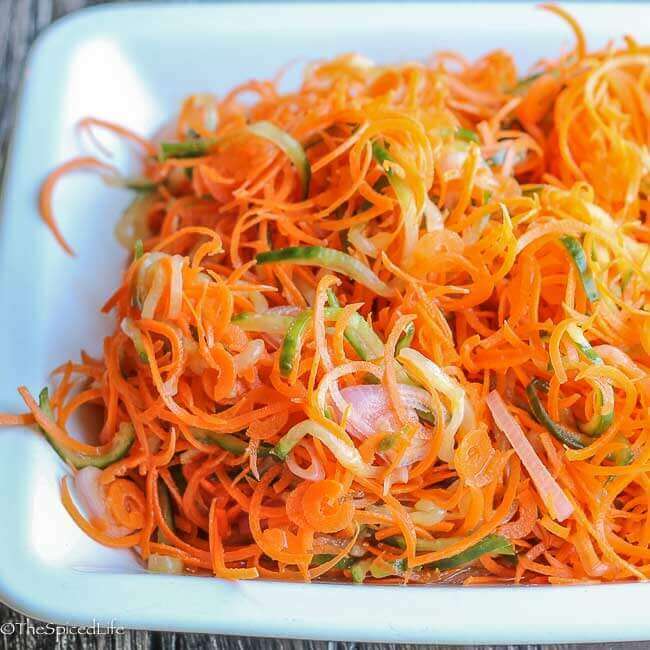 Toss the spiralized carrots and cucumbers together in a large bowl. Set aside. Make the dressing--whisk together everything but the oil. Then slowly drizzle the oil into the dressing while whisking briskly. Drain the onions and toss them into the salad. Pour about 2/3 of the dressing over the carrot mixture and toss. Serve the salad in individual bowls topped with a handful of the Nori Granola and the option of more dressing on the side. Garnish with toasted and seasoned nori sheets if desired. This is beyond awesome! How unique and creative!!!! Love everything spiralized and of course I’m a granola fiend! Wow! I love all the flavor in this recipe. 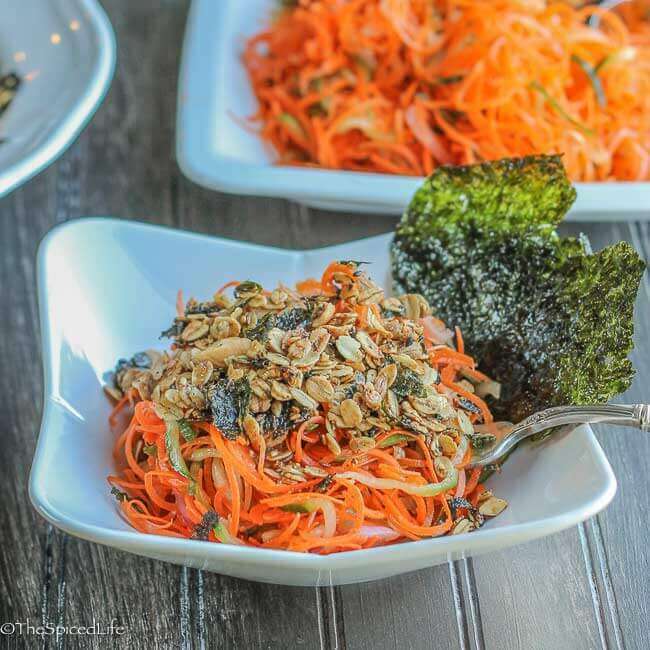 The nori granola sounds amazing and perfect to serve with a carrot salad. What a beautiful looking salad! 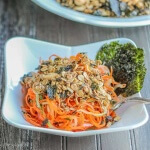 I really need to get on this spiralized train…they look so good! The salad looks delicious! Your composition is fantastic! This looks so flavorful and crunchy! I want a bowl for lunch! 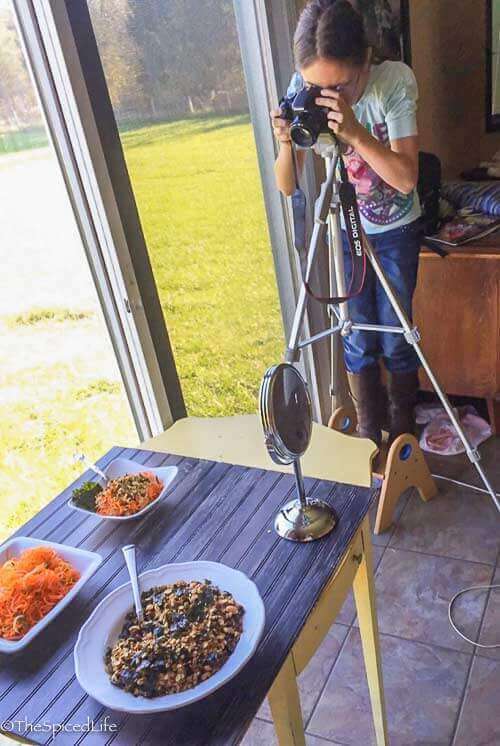 It’s fun seeing your daughter behind the camera and taking part in food styling. My four year old little boy likes to pretend to take photos with me with an old broken camera I gave him. For Christmas I got him kid’s vtech one so that he can really get into the fun! I’m sure many of use food bloggers will have kids that leave our homes as talented photographers! this looks absolutely gorgeous! I love spiralizing carrots! What a beautiful salad. I love that you’ve used a savory granola on it too. Great idea!